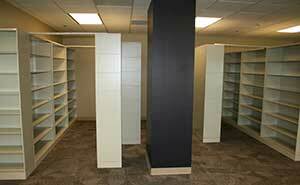 We specialize in creating innovative, space-saving solutions for any business. Here are a few examples to show you how we can dramatically improve the day-to-day operations of your company through the introduction of high density filing systems and other equipment or technology. To get more details on our projects, please click on our case studies below. Challenge: Move a Department of Defense History Office’s aging mobile filing system located in a top secret building to a new state of the art building with minimal disruption to operations. Strategic Command’s Office of the Historian stored their top secret records in a high density mobile filing system whose manufacturer no longer made the shelving riding on its mechanically assisted mobile carriages. STRATCOM contracted Trade Products Group (TPG) to equip the new building’s furniture, fixtures and equipment (FF&E) and TPG in turn sub-contracted Advanced Filing Systems (AFS) to move the mobile filing system. AFS faced the challenge of matching up new four post shelving to the existing L&T shelving (now out of production), fit it to the mobile carriages, remove the existing rail, ramp and deck then move all the shelving and mobile components to STRATCOM’s new headquarters building. Once in the new HQ building, AFS had to match up and modify the existing four post shelving with new shelving, then refurbish and reinstall the mechanical assisted carriages and crank mechanisms. All without disrupting the Historian’s Office daily high volume workflow. Solution: AFS worked remotely with TPG’s onsite designer for six months to design a hybrid mobile filing system incorporating the out of production Burroughs four post shelving with Aurora Storages L&T shelving. After more than a dozen revisions - AFS, TPG and STRATCOM agreed to a design that would use the majority of the existing mobile system yet incorporate enough new components to fit the new space’s design. Before AFS’s installers could tear down and move the Historian’s mobile system it had to be emptied. AFS worked with STRATCOM staff to remove and catalog the top secret files that traced the history of the United States nuclear weapons systems program. 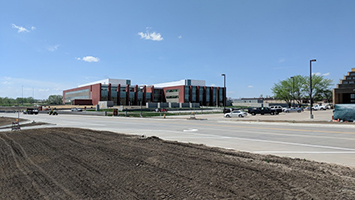 AFS installers then trucked and carted the system over a mile to the new HQ building where they reassembled it per the Configura design. To do this - Advanced Filing installers laid new carpet tiles over the plywood ramp and deck after it had leveled the rails to prevent carriage drift. Strategic Command’s History Office then reloaded its top secret media back into the refurbished mobile system. STRATCOM’s Historian was back in operation with minimal disruption - its mobile filing system overhauled and working like new. Challenge: The UM BPEI in Naples FL, had outgrown it's existing location and needed more space for it's expanding case load. With land scarce and expensive in downtown Naples FL, it needed to make the best use of space in it's new building. 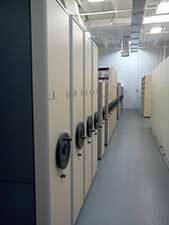 UM BPEI turned to Advanced Filing and Florida Office Systems for high density storage solutions. UM BPEI also needed to track inventory of their equipment and supplies as well as secure their expensive clinical equipment and supplies to prevent theft and loss. Solution: Advanced Filing and Florida Office System's experienced team of professionals designed a high density mobile storage system that maximized packing density in the small area allotted for eye surgery clinical supplies and equipment. 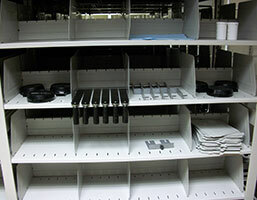 The high density storage system mobilized shelves on rolling carriages to double the capacity that UM BPEI would have had with traditional shelving. With inventory control paramount, Advanced Filing and Florida Office Systems designed a labeling system mounted on the carriage end panels. 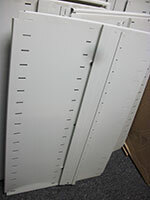 This visible records system allowed UM BPEI to track inventory as it moved in and out of the compacted storage system. To prevent theft and loss, locks were installed on carriages at the end of the system so they could be securely locked when the mobile carriages were compressed together to form a solid cube. In summary, our systems approach to storage provided UM BPEI a secure, well organized storage system that provided the most capacity in the small amount of space provided. Challenge: Palm Beach County’s Department of Waste Management recently added an additional plant to their current facility. As the new plant came with additional efficiencies and waste capacity, more documents will be generated. It was crucial for the end-user to be able to find their documents quickly and efficiently. As floor space in South Florida is at a premium, it was important for the filing system to take up as little space as possible. Solution: A custom Richard Wilcox Aurora Mobile Filing system was designed to house and protect the Waste Authority’s documents. Our custom design enabled the room where we installed the high density mobile system to be a multi-function/multi-use space. 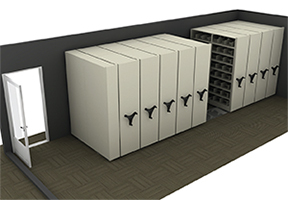 We designed the compacting high density storage system to run along the back wall so that the other part of the room can be used as a meeting room and or conference room. The mobile system provides West Palm Beach Department of Waste Management a high capacity filing system, utilizing end-tab filing folders to maximize packing density. We installed the Richards Wilcox Aurora High Density System with chain boxes and left out the cosmetic end-panels to maintain a competitive price but still look good and maintain file integrity. The end-user was thrilled with their new filing system, as it provides them with plenty of storage for their current documents as well as an abundance of space for future growth. Challenge: Lee County Transit Authority, of Fort Myers, Florida wanted a neat, clean, and efficient way to store the transit authority's employee's uniforms. 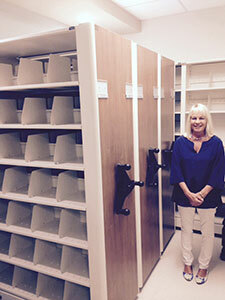 Solution: Bill Wells of Advanced Filing Systems of Bradenton, Florida provided the solution, by using Datum Storage Systems garment racks in Datum's 4 Post L&T shelving. The rods are adjustable in height to confirm to almost any size garment. 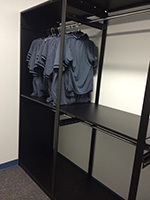 In the future when the Lee County Transit Authority needs additional storage space, the garment racks can be used on a high density mobile storage system to increase employee uniform packing density and reduce the physical space footprint required to store employee uniforms. Challenge: SOCSOUTH quickly outgrew the 'temporary' trailers it moved to at HARB in 2004 as global pace of terrorist events increased. Its personnel lacked storage space for personal combat gear, medical supplies, 'Secret' classified equipment and warehouse storage. The US Army Corp of Engineers contracted Carothers Construction to build a new Headquarters. Carothers in turn selected Commercial Design Services to provide the furniture, fixtures and equipment. 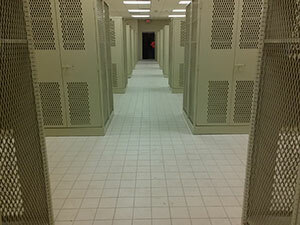 CDS selected the footprint reduction specialists at Advanced Filing to design the storage solutions. Solution: We designed and installed Datum High Density Mobile Storage Solution to house the Medic's Equipment for quick access in the minimum space so that it was easily accessible for deployment. 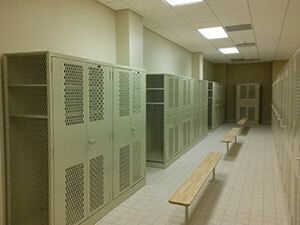 We installed fully welded TA-50 personal combat equipment lockers in the Men's and Women's Locker Rooms along with more TA-50s for secure storage of equipment in private offices and warehouses. Pallet Rack went into the Warehouse and Loading Dock for Bulk Items while separate Bulk Wire Storage Cages provided lockable storage for out-sized equipment. Advanced Filing finished this job ahead of schedule. The US Army Corp of Engineers post installation inspection grade came in with Zero defects. 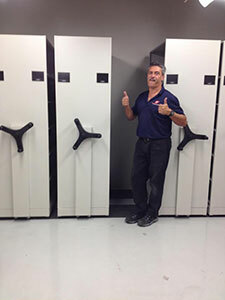 Challenge: When Broward Schools Facilities Department had to move on short notice from Lauderdale Manors Elementary in Wilton Manors, FL to Sunset School in Riverland, FL, they called on Advanced Filing and Florida Office Systems to disassemble, pack for moving and reassemble their sophisticated high density filing equipment. Advanced Filing and Florida Office Systems deployed two teams of Datum Certified Installers (DCI) to disassemble, pack for relocation and reassemble three types of equipment; a Kardex High Density Mechanical Assist Mobile Filing System, a Kardex High Density Electrical Assist Compressed Mobile Filing System and 12 Richards Wilcox Aurora Times X2 Rotary File Cabinets. Most of the electrical contacts and switches on the electrically powered compressed mobile system had failed and the resulting system malfunctions stopped the mobile carriages from moving along the rails. When Broward Schools staff engaged the start/stop buttons mounted on the end panel mounted, the system frequently failed to move or stopped after moving slightly. The mechanical assist mobile systems also had a problem. It is lock/unlock magnetically controlled toggle switches mounted on the carriage end panel no longer worked. That prevented Broward School Board Staff from securing the mechanically powered rolling carriages. In addition to the Kardex Electrical and Mechanical Mobile Systems, Richards Wilcox Aurora's Times 2 Units had binding moments when School Board staff depressed the foot pedal to turn the Unit manually. Along with the equipment problems, our Design team faced the challenge of fitting all the equipment in areas not originally built to house it. Moreover, Broward Schools changed the allocated space along with staff functions and workstations required in the new rooms. Solution: We engaged Broward Schools Facilities and ACAI Associates in continuous dialog to stay abreast of the fluid floor space situation at Sunset School. Our designer used product specific design software to draw multiple options for consideration by the Broward Schools Facilities staff and their contracted architect, ACAI Associates. As the situation changed, our design staff quickly produced new designs to meet the new requirements. Once everyone had agreed on the design, our install teams swung into action to re-install the equipment. Our electrical mobile system installers diagnosed the faulty contacts and switches then ordered replacements. We laid the rail, ramp and deck; replaced the faulty electrical parts in the safety sweeps, overhead scissor arms and carriage mounted control panels then placed the carriages on the tracks. Next, we built the shelving to provide maximum capacity for the things Broward School Board wanted to store. 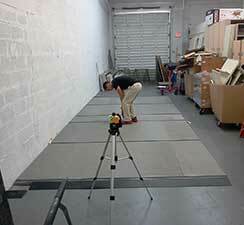 Our mechanical assist mobile filing systems team took a similar approach with the faulty magnet lock switches. Similarly, our Rotary X2 installation team re-leveled the X2 Bases, lubricated the Foot Petals and bent the sheet metal sides to prevent binding when the units rotated. When we finished the entire job 2 days ahead of schedule Broward Schools high density compressed storage equipment worked just like it did the day they bought it more than 10 years ago from Office Systems of Florida. Challenge: As the world's busiest seaport, Miami-Dade County Seaport Human Resources needed additional capacity to handle the hard copy mail required to staff 400 positions. Miami-Dade Seaport renovated its administrative directorate for human resources to manage its staff that operates the world’s largest cruise line seaport. 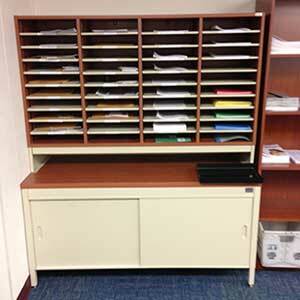 Its existing mailroom lacked the quantity of mail slots to handle the diverse quantity and size of mail and packages it sorted on a daily basis. Solution: Advanced Filing Systems and Florida Office Systems designed and installed a heavy duty Datum Mail Sorting Station to provide Miami-Dade Human Resources the capacity and flexibility to process the heavy mail volume that consisted of a diverse size of boxes, envelopes and packages. Datum's slide out Sorting Shelves allowed Miami-Dade Human Resources to size their mail slots to manage the quantity and variety of documents handled on a daily basis. The Sorting Stations bi-slider doors provided private storage for supplies and large packages, the 7" Riser raised Sorting Bins above the Work Surface to allow mail handling on the entire 24" depth of the Sorting Station. Finally, the slide-in slide-out sorting shelves allowed Human Resources employees to size openings for flexible mail handling regardless of package dimensions. With its new mail station in place, Miami-Dade Human Resources gained the capacity and flexibility to support the world's largest cruise line port. Challenge: When Boar's Head Corporate Headquarters in Sarasota Florida leased new space to expand corporate headquarter it discovered the new area's floor would not support the load of its Datum MT5 high density rolling file. They called Advanced Filing to work with their architect to design a static system to repurpose their mobile system's Mobile Stak legal depth cabinets into a static system with the same lineal filing inch capacity and at the same time meet the lighter floor loading requirements. 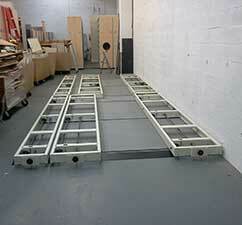 Solution: Advanced Filing and Florida Office Systems disassembled the MT5 system from the top down. First it removed the Mobile Stak legal depth cabinets and replaced the 1 inch mobile bases with new 4" bases equipped with leveling glides. Advanced Filing's Datum Certified Installer (DCI) adjusted the new leveling glides and overhead anti-tip stabilizing bars to safely secure the units in the vertical and horizontal. With the Mobile Stak Cabinets safely reconfigured from a double aisle carriage mounted rolling configuration to a stationary multiple aisle layout Advanced Filing satisfied Boar's Head's twin objectives. 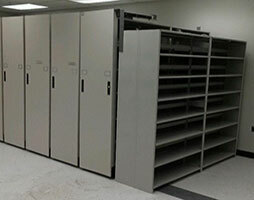 The repurposed Mobile Stak cabinets provided file room staff with the same capacity and the revised stationary design enabled the floor to hold the loaded cabinets. Challenge: When the Early Learning Coalition (ELC) took over child development services from Miami Dade Human Services it faced the challenge of integrating three geographically separated Datum Mobile Track 5 (MT5) high density rolling file systems into one central file room consolidated storage system. 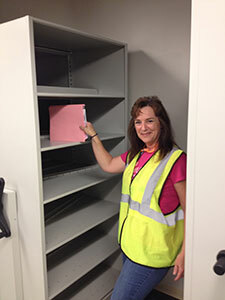 In addition to the three mobile filing systems, ELC had to transfer the confidential color-coded end tab folders and file pockets from the 4 Post Shelving in each system into one consolidated compressed storage system in ELC's new Doral FL central file room warehouse. Since the documents contained sensitive child development information complete security had to be maintained throughout the move. Solution: Advanced Filing and Florida Office Systems used Datum's Configura drawing tool to design one system from the 4 Post Shelving, Tambour Door, MT5 carriages, steel rail and polyvinyl deck from the 3 mobile filing systems in Narranja, Coconut Grove and Miami Gardens. Our expert designer created a solution that utilized all of the rolling carriages, un-grouted deck, steel ramp and 1" rails in the 3 separate high density system. Our Datum Certified Installer (DCI) took the design and turned it into reality. But the process began when our professional services team unloaded the confidential files from the 4 Post Shelving onto Library Carts. The professional services team used the folders and file pockets patterns of color wrapped around the Redrope Pockets and Manila Folders End Tabs to maintain the integrity of the alphabetic system. The Professional Services team unloaded the files in reverse order onto the carts, wrapped the carts in black shrink wrap the tapped the shrink wrap. Torn tape over the shrink wrap would reveal the folders had been tampered with. After the team loaded the files onto the carts, they pushed the carts up a ramp onto a 53' trailer then stored the trailer in a secure area. The professional service team reversed the process when it re-loaded the folders onto the new central file system. Florida Office System's attention to detail and meticulous filing protocol ensured the folders chain of custody went unbroken. Florida Office Systems combined the talents of its Design, Project Management, Installation and Professional services team to complete this project on time without a single security breach. With the File Pockets and Folders back in place ELC's file room staff can utilize the computerized bar code tracking system to continue maintenance of the chain custody going forward. Challenge: The Broward County Sheriff’s Office confiscates thousands of illegal weapons a year. Many of those weapons are kept for forensic testing in order to help solve similar crimes. The Broward County Sheriff’s Office needed more space and better organization for guns, pistols, ammunitions and evidence. Solution: We installed a mobile shelving system tailored to organize weapons and evidence of various shapes and sizes for a tight space. The compact mobile weapon storage system was equipped with steel gun racks for rifles, barrel pegs for hand guns and shelving for evidence. The barrel pegs were ordered in various diameters to neatly store BSO’s eclectic collection of unique pistols. Challenge: The Clerk of Courts was expanding their warehouse storage space and needed the right shelving for the job of storing LLC. bankers boxes filled with critical court case folders. Solution: We installed a shelving system for storing thousands of archive boxes inside the North Courts’ new warehouse space. We erected heavy duty rivet span posts and beams within 18 inches of the warehouse's ceiling with openings sized for optimal box storage and access. 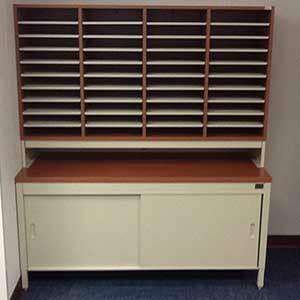 Particle board decking was installed to provide a firm yet inexpensive base for the heavy archival boxes. Challenge: MDHS was faced with the challenge of keeping a growing number of confidential files organized in a limited amount of space. Solution: We created a mobile shelving system with locking Tambour Doors that maximized and secured the existing filing space. Our shelving system increased the filing capacity at MDHS by 300% easily, providing enough storage space for existing files and future growth. We introduced Virtual Labels custom label software to optimize file organization by recognizing patterns of color and barcodes.